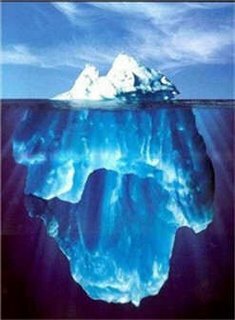 ICEBERG: mass of ice that has become detached, or calved, from the edge of an ice sheet or glacier and is floating on the ocean. Last night was one of those nights where I was thinking so much, writing so much in my head, that by 3:30am I was marking time until I could get up and make the words real. Permanent. Much of what I was thinking about will go directly into the book. I need to write them like I feel them now - raw, bare, bold. Those words are not for my blog, sorry. But the inspiration? It was real. As real as these words you are saying along with me, wherever you are. My inspiration was journey I took last night, a boat ride south. Past the Caribbean, around Venezuela, Brazil, still heading south. Drifting aimfully to find an iceberg. It was a journey I could not explain, even to myself, and one to which I was both ridiculously and expectantly attatched. When I finally found the iceberg that I hoped -- knew? -- would be waiting, it woke me with a bump. I was not startled. Just grateful. I did not anchor, for fear of scarring the giant. It was a work of art, entirely. Magnificent, beyond what I could have hoped for. At least the part I could see. For hours I sat in my boat, chin resting on my left knee. It was a quiet, reflective position, one that felt like the warmth I was seeking. I should have felt much colder, but it felt like home. Safe, strong, familiar. Icebergs are not silent. They crack and pop, like someone tapping their pen on a desk to punctuate points. I listened, listened so carefully for a word - a sign - an answer. It mocked me, gently, because there was no question needing an answer. So I spent hours admiring it. Combing every bit of it with my eyes, memorizing the beauty of every groove. The smile from that dream is still bright on my face. Maybe, just maybe, that was what the pilgrimage had been all about.